The dish is full of that unmistakable aubergine flavour. Perfectly complimented by tangines of tomatoes. Result is one of sublime deliciousness. Aubergines/Egg plants are full of vitamins, minerals and dietary fibre and with the potential to lower cholesterol and help manage weight. It also helps to prevent cancer and lowering cholesterol. • Cook the pasta in a large saucepan of boiling salted water until it is cooked. Drain and set aside. • Heat oil in a saucepan add onion, crushed garlic and saute until tender for about 3-4 minutes. • Then add Tomatoes and cook until mushy. Add sliced aubergines and continue to cook until it is tender ~ 5 – 6 minutes. Then add cooked Pasta mix well until coated with the sauce. • Aubergine can be chopped small if you don’t like big chunks in your dish. Posted on March 28, 2015, in International, Main Course, Vegan and tagged Aubergine Pasta, drchdietfood, Italian. Bookmark the permalink. 20 Comments. 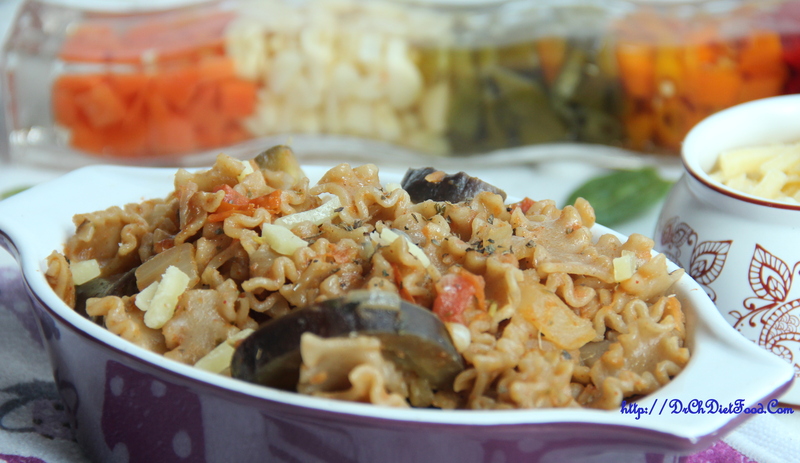 This sounds really good–I’ve never made a pasta dish with eggplant–great idea! Aubergine Pasta, looks great Chitra!!! Anything full of aubergine works for me!! This sounds great, but cheese is not vegan. 🙂 But you can always use a cheese substitute.